Quick Charge : USB Type C 2.0 Cable - USB C to USB A cable, 8% faster than standard cables. Quick Sync: Charger Cable supports 480-Mbps transmission speed. Durable cable jacket is woven tightly with premium fiber braided materials, resists kinks and tangles. he aluminum connectors fit tightly and perfectly, and won't get loose or fall out of your devices. premium fiber braided jacket + aluminum connectors. Compact, heat-resistant, stainless steel connector heads slot in easily and securely fit, can satisfied your different demands in travel, office and home use. If you for any reason are not satisfaction by Kakaly, please do not hesitate to contact us and we will do our best to solve your problem! ❤Compatible with - Type C cable works well with Samsung Galaxy Note 8, Galaxy S8 / S8 Plus, LG V20 / G6 / G5, Google Pixel / Pixel XL, Nexus 6P / 5X, OnePlus 5 / 3T / 3 / 2, HTC 10 / Ultra / U11, Moto Z / Z Play / Z Force / Z2 Play, Sony Xperia XZ / XZS / XZ Premium / XA1 Ultra, Huawei P10 / P10 Plus, Honor 9 / 8, Nintendo Switch, 2015 Google Chromebook Pixel, 2015 MacBook with 12'' Retina Display, Asus Zen Fone3, HP Pavilion X2 and other devices with USB-C connector. 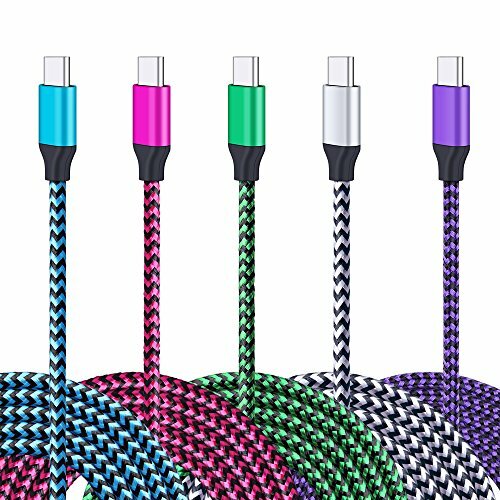 ❤Nylon Braided, Extreme Durability: With a tested 8000+ bend lifespan, this USB C charging cable is far more dependable than others in its price range. Premium nylon braided Type C cable adds additional durability and tangle free functions. ❤6FT Long Cable - You can lie on the couch and use your devices while you are charging at the same time. And you can still use freely in in your bedroom, office and even in the backseat of your car. ❤Super fast charging time, conforming to the USB Type C Specification version 1.1, 480 Mbps., which ensures a safe charging at 2.0A Maximum. Perfect long enough cords, enjoying the data sync & charge anywhere and anytime and do not need to worry about bringing your cables anywhere. If you have any questions about this product by Kakaly, contact us by completing and submitting the form below. If you are looking for a specif part number, please include it with your message.